Conclusions Registration is very expensive around BND298 but in term of travelling there is only one stop i.e KLIA. Hotel stay ranges from BND$354++ to BND$558++ (3Nights) and this hotel is within the race venue. Cheaper hotels are more available around KL and the most cheapest would be Hotel Tune at Air Asia LCCT (RM261.05) which is around 35mins drive to Race Venue. 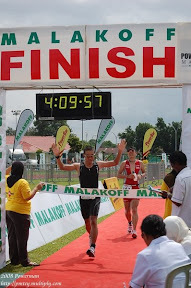 I would choose Ironman Putrajaya because overall it is much cheaper and less travelling. Hotel stay ranges from BND356++ to BND187++ including one night stay at KL before departing to JB the next day. Overall it becomes expensive and costly and furthermore you have to carry around your bike. My advice, bring a friend along to help you.